The Cree (Nehiyawak in Cree) occupy a large northern area extending from around James Bay west to Lake Winnipeg and south to Lake Nipigon. They were pushed farther west by the fur trade until their tribes reached well into Saskatchewan. The Cree spoke variations of the Algonquian language and had nine dialects including Plains Cree, Swampy Cree, Naskapi and Montagnais. These last two prefer to call themselves Innu, meaning "person." The Naskapi live in the northern lands between Hudson Bay and Labrador. The Montagnais are in the forested area to the south of them. The Cree lived in a harsher environment than the more southerly or west coast peoples. They had to endure long cold winters and hot, mosquito-infested summers. There were not many plant foods available so their diet relied mostly on hunting large and small animals with bows and arrows or snares. Like the Anishinaabe, the Cree also feared the spirit of the flesh-eating Windigo who could drive some of their people to cannibalism during times of starvation in winter. 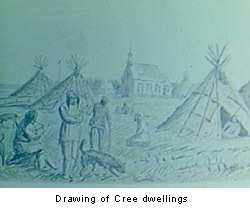 The Cree lived in dome-shaped wigwams or conical tipis. The wigwams were made from green saplings bent into a dome shape which could survive severe weather. They were more difficult to move and were generally found in the woodland areas. The tipis were often covered in animal skins instead of birchbark especially on the plains where there were fewer trees. Some dwellings were larger lodges. Some were smaller and more portable. The small tipis were easier to move if the people used dogs for their main means of transport. In winter they often lived in sodsod: a layer of ground containing grass and its roots, usually cut into pieces or strips. houses. In the hunting season the Cree travelled in hunting bands of three to five families. In summer they gathered in larger communities around a lake where they could fish. Religion influenced their hunting practices. The hunter had to respect the animal he was hunting. It was a "gift" and the animal would not allow its species to be caught again if the kill was not given thanks and respect. Sometimes animal bones were burned and the cracks and scorches on their surfaces were interpreted as trails to follow in search of game.